It has been almost five months since the last major auction took place, back in November 2017 in Geneva. On April 3 in Hong Kong, Sotheby’s will launch the first of more than a handful of major auctions for the first half of 2018. Below is a summary highlighting the best fancy color diamonds that will be offered. They are listed in order of their valuation by the auction house, starting from the highest valued item. Can a Fancy Blue diamond double in value over a two-year period? The most expensive fancy color diamond being offered at this auction is the 14.18 carat Fancy Blue diamond. It has a rare VVS2 clarity and is cut in a beautiful Emerald shape. 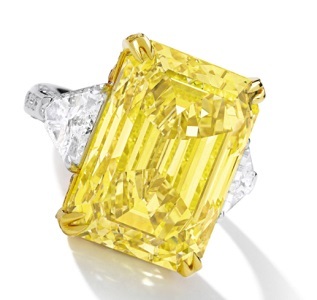 Sotheby’s has valued it to sell at a price between $5.9 million and $7.6 million total, or $416.5k to $540.9k per carat. 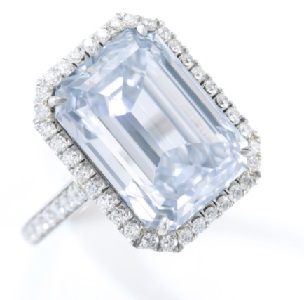 What makes this blue diamond particularly interesting? That would be Sotheby’s failure to mention that it already offered this diamond to the public only 2 years earlier at its Geneva auction back in May 2016. Why would Sotheby’s not mention this fact? It was item #486. Back then, it was valued at $2.95 million to $4.91 million and ended up selling for only $3.7 million, or just under $261k per carat. We mentioned in our article that covered the results that the price was low due to weak color. Although the certificate graded it as a Fancy Blue, the price at which it sold reflects a Fancy Light Blue color, a weaker color grade than a Fancy Blue. It could be that the color was such a strong Fancy Light Blue that it was certified as a Fancy Blue in the certificate. Back then the GIA certificate was 14138150 while this time, the GIA certificate is 6183520528, which means that the diamond has been re-graded. Did the GIA also miss that they already graded it once? Is this diamond that elusive that the GIA and the buyers are all forgetting that this diamond has appeared before? Sotheby’s should have stated that it had offered this diamond at a previous auction. This would only build more trust and transparency between buyers and sellers, a key factor that is sorely lacking in today’s diamonds industry. Why is this kind of disclosure done so easily in artworks, but fails miserably in diamonds? The value by Sotheby’s accurately reflects the current market price for such a rare Fancy Blue diamond, if you would even be able to find one being offered. However, the color remains weak and that could affect the ultimate price. With Blue diamond prices increasing over the last 2 years, we should see a higher value given to the diamond, and the buyer will most likely see ROI on his hammer price. Is it justified to estimate that the diamond will earn twice the previous price? Absolutely not. Any expert will be able to see that the color is weak. I look forward to reporting to you what it ends up selling for at the auction. Generally speaking, the most return on a fancy color diamond occurs after reselling over a much longer period of time. Coupled with the fact that this diamond does not have a weak color, I do not have especially high expectations for this diamond’s new hammer price. 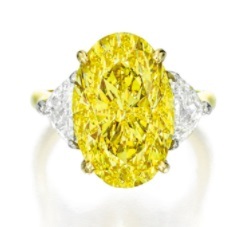 The next item by value is a rare 30.16 carat Fancy Vivid Yellow Diamond with a VS1 clarity. It is estimated by the auction house to sell at a final price between $2.4 million to $3.2 million, or $80k to $106k per carat. This can be considered a very high price, unless the color is a strong one, which would justify the incentive to demand top dollar. The subsequent diamond by value is one whose type has not been seen for quite some time. It has been a long time since we last saw a 5 carat Fancy Vivid Purplish Pink at auction. The only disappointing factor about this 5.01 carat Fancy Vivid Purplish Pink diamond is that it is a half certificate, which means that the clarity grade is an I2 or less. Investors want the best of the best, and often that means that the clarity of a diamond needs to reach a higher clarity grade than this diamond does. This is reflected in the valuation by Sotheby’s. The diamond is valued at a range between $2.04 million to $2.56 million, or $408k to $510k per carat. A higher clarity Fancy Vivid Purplish Pink diamond would be valued at least at $1.5 million per carat, so at least 3 times more than this diamond’s highest estimate. The next item by value is a necklace containing a set of fancy color diamonds. Both are similar in shape, the shield shape, which makes the pair rare and an interesting piece of jewelry. 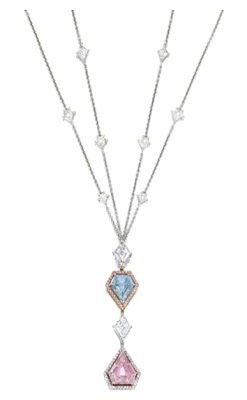 The necklace features a 2.85 carat Fancy Intense Purple-Pink diamond with an SI1 clarity and a 1.61 carat Fancy Intense Blue diamond with a VVS2 clarity. The necklace is valued at $1.2 million to $1.4 million total. Our independent estimates are that the Fancy Intense Blue diamond is valued at about $450,000-$650,000 per carat (giving it a value of $724k to $1.05 million), while the Fancy Intense Pink is valued at $150,000 to $200,000 per carat (giving it a value of $427k to $570k total). Combining our own valuation, this would put the total value at $1.151 million to $1.62 million for the necklace, a higher estimate than Sotheby’s has considered. We have taken into consideration that both diamonds have a similar shape, and therefore are considered a pair. Pair status adds significant value in fancy color diamond valuation, since it is incredibly hard to match fancy color diamonds as each one is so unique. 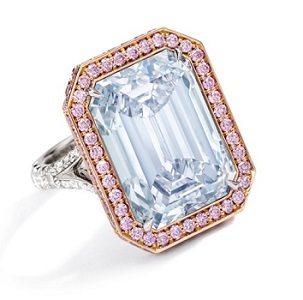 Another great pair of blue and pink diamonds is this ring. 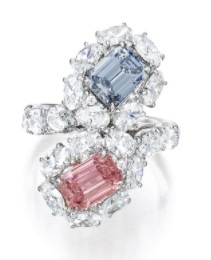 It has a 1.26 carat Fancy Intense Blue diamond with an IF clarity, as well as a 1.15 carat Fancy Intense Pink diamond with an IF clarity as well, both emerald cut. The current total value by Sotheby’s is $1.2 million to $1.5 million. Our independent estimate is that the Blue diamond should be valued at $650k to $750k per carat due to its clarity (so total value at $819k to $945k), and the pink diamond should be valued at $250k to $300k per carat, also due to clarity (making total value at $288k to $345k). Our valuation puts it at $1.1 million to $1.29 million for the ring. Due to the rarity of the pair, we would add an additional 15% to its overall value, so it should be valued at $1.265 million to $1.48 million. Let’s see what happens at the auction. Disclosure: I facilitated the sale of this pair back in September 2016 with their updated certificates. However, our current valuations are based on current market prices and not based on their selling prices back in 2016. The next item that we will review is a beautiful 10.30 carat Fancy Vivid Orangey Yellow diamond with an IF clarity and excellent polish and symmetry along with no fluorescence. This diamond is true rarity for one that weighs over 10 carats. It is valued at $1.15 million to $1.4 million, or $111.7k to $136.5k per carat. This valuation reflects the true nature of rarity- supply and demand as reflected in price. The next review is a 6.40 carat Fancy Orangey Pink diamond, with an exceptional Internal Flawless clarity. 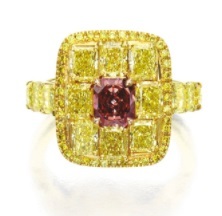 The value by the auction house is $1.05 million to $1.4 million, or $163.8k to $219.7k per carat. 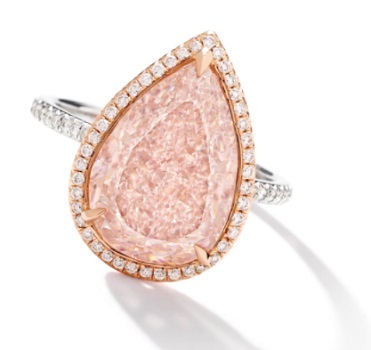 We see that the value of Fancy Orangey Pink color is roughly half the value of a Fancy Pink diamond, one without the orange modifying tone. This is just a general rule of thumb, and each diamond must be carefully analysed for the effect that the color has on its price. 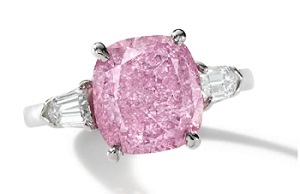 A straight Fancy Pink diamond of this size and clarity would be valued in the $350k to $500k per carat range. Based on our rule of thumb, this diamond should be valued at $175k to $250k per carat, or $1.12 million to $1.6 million total, a slight higher value than that of Sotheby’s. The next item is a magnificent pair of earrings that are unique due to the pairing style. 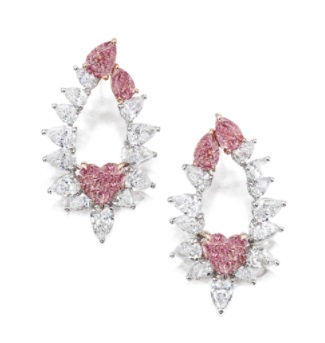 The earrings contain a pair of pink heart shaped diamonds. One is a 1.01 carat Fancy Vivid Purplish Pink diamond and the other is a 1.02 carat Fancy Intense Pink diamond. Both have half certificates, which suggests that they both have an I1 or I2 clarity. The smaller, pear shaped diamonds are both Fancy Vivid Purplish Pink with VS2 and SI2 clarities. So why is it that this pair of earrings are valued at $1.022 million to $1.4 million total, which is pretty high for these diamonds? The answer is quite simple – all four diamonds are from the argyle mine in Australia. Both of the heart shape diamonds have been re-polished from their original weights of 1.14 and 1.15 carats. Their Argyle branding makes them even more valuable to buyers and investors. This Fancy Vivid Yellow diamond is also unique, but it is additionally interesting because it puts the Fancy Vivid Orangey Yellow diamond above in perspective. This 10.49 carat Fancy Vivid Yellow diamond is in similar weight to the 10.30 carat diamond and both have Internal Flawless clarity. Both have an excellent polish, but this diamond is graded with very good symmetry compared to the 10.30 carat diamond’s excellent. This diamond also has a faint fluorescence, compared to none for the orangey yellow. This has a slight impact. The orangey secondary color makes that diamond have a super color. This why the valuation is quite different. This diamond is valued at $703k to $895k or $67k to $85k per carat (compared to the orangey yellow’s $1.15 million to $1.4 million, or $111.7k to $136.5k per carat). 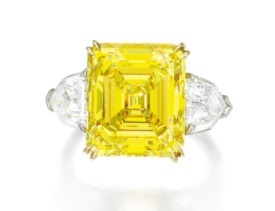 This reflects strong but justified value for vivid yellow diamonds above 10 carats. 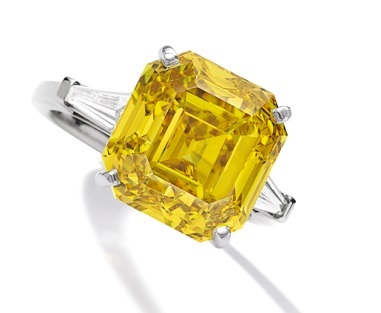 This 7.28 carat Fancy Vivid Yellow diamond is unique due to its provenance. Some may care more than others about provenance. Increasingly, companies, investors, and consumers alike are beginning to appreciate and value provenance when choosing diamonds. This one is a Cartier diamond dating back to 1976, which makes this diamond more than 42 years old. It is valued at $703k to 831k, or $96k to $114k per carat. Although the next item is described by Sotheby’s as a rare and unique fancy color diamond due to its shape and color, after a more careful look, it is much less rare than it is presented. The 1.97 carat Fancy Intense Green VS1 round shaped diamond has been certified as such by the GIA. If we purely look at the certificate, indeed, the claim for its status would be valid. But as we have repeated many times, it is all about the color. At first glance, it seems to be a Fancy Intense Green color, as described by the GIA, but since it is a round brilliant, the color is strong in the table only and all around it is weak. The GIA gives its color by looking at the table only. If we had to look at the face up and give it a color grade based on the full crown, we would grade it only Fancy Green. The green diamond is valued at a price between $511k to $703k, or $260k to $357k per carat. 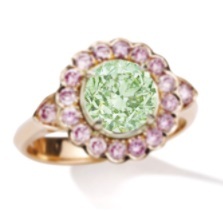 For a true Fancy Intense Green round brilliant diamond, I would have agreed on the value. Since illusion plays a great part here, it should be valued as a Fancy Green at best, giving it a value between $80k to $140k per carat. This is my opinion, based on viewing the real diamond, and not simply just the picture. 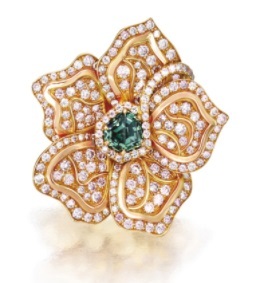 This next diamond is a magnificent Fancy Deep Bluish Green diamond with exceptional color. It is 1.08 carats in size and has an SI2 clarity. It is valued at $332k to $409k, or $307.7k to $378.8k per carat. Let’s see what happens at the auction. The last item we are reviewing is once with a red diamond. The 0.62 carat Fancy Red diamond has an SI1 clarity, which is typical of red diamonds. It is surrounded by yellow diamonds of almost similar weight. It is valued at $217k to $281k, or $350k to $453k per carat. Based on the current supply of red diamonds above 0.50 carats and up to 0.75 carats, this diamond should sell for over $500k per carat, if not more, so at a price higher than Sotheby’s highest estimate. I look forward to reporting the results after the auction on all these unique items. The auction results should give us a general view of how the rest of the year will unfold, not only in the auction scene but also for fancy color diamonds in general. The auction houses are working harder than ever to bring unique items to the auction, which is getting all the more difficult as supply for fancy color diamonds wanes. Ultimately, it is in the hands of the buyers to determine whether these diamonds are worthy. Got any questions? Ask us in the comments!